Miami itself is an open-air art museum. It's a joy to walk along Ocean and Collins Avenues in South Beach and admire the pastel and neon art deco buildings which now house hotels, cafes and restaurants. Go into some of them, have a drink at the bar, and luxuriate in the elegant surroundings. Stroll along the beachfront walkway and breathe in the fresh air, visit the Holocaust Memorial for an emotional experience, and then lift your spirits by touring the Botanical Gardens next door. Or, take a trip to the Everglades and observe the Miccosukee Indians at work creating beautiful crafts including jewelry and beadwork, weavings, baskets, dolls and tin work. Vizcaya is an Italian neo-classical mansion built as the winter estate of James Deering (1859-1925), Chicago businessman, executive of family-owned Deering Harvester Company, later International Harvester, Miami socialite and collector of antiquities. Today, his mansion at 3251 South Miami Avenue is a National Historic Landmark and a museum open to the public. The house is meant to look old, as if a family had lived in it for years. It contains antique furnishings and artwork collected in Europe along with furnishings made especially for Vizcaya. The house is two-stories high and contains a central courtyard with a glass-enclosed rooftop surrounded by pillared arcades. This provides a sunny place to sit down and admire the lush tropical plants, fountains, and classical pink and cream-colored architecture. You can tour the rooms in the house which include a reception room, living room, dining room and serving pantry on the ground floor, and a sitting room, bedrooms, pantry and kitchen on the second floor. The east loggia leads out to a terrace overlooking the bay, an enchanting spot to admire the barge, boat landing and tea house. Some areas are reminiscent of Venice with its canals and bridges. Formal gardens off to the right of the mansion were built in 1922 between the mangrove shore and the rockland hammock. 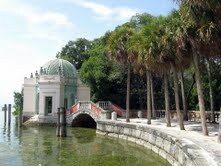 Deering's decision to build the gardens here and preserve the shoreline and forest set him apart as one of the earliest environmentalists in Miami. They are lovely to behold with pools, parterres, statuary walks, cascades, swimming pools and grottoes. Graffiti has been in existence for centuries and many fine examples date back to ancient Egypt, ancient Greece, and the Roman Empire. Here in Miami though, graffiti has risen to heights never seen before. The old Wynwood area was once a dilapidated industrial and warehouse district; today it is trendy and one of the world's greatest outdoor street museums, showcasing graffiti art created by some of the best “writers” in the world. The idea was conceived in 2009 by Tony Goldman, a renowned community revitalizer who felt that this genre of art, once considered a blemish on the landscape, was undervalued and underappreciated and decided to create a unique “museum of the streets” here in Miami. The area comprises more than 20 blocks and is especially concentrated at NW 2nd Avenue and 25th Street. Since its inception, over 50 top graffiti artists representing 16 countries have written on 80,000 square feet of wall area in the Wynwood district. The bright bold pieces of aerosol art make political and social statements and include paste-ups, arrows, curves, spikes, cursive, block and bubble letters, and the dripping styles of horror comics. Some make you smile and others ask questions, but all are created by geniuses and are extraordinary. Artists represented include Case, Swoon, Pro176, Daze, FAILE, and PHASE 2. This “museum” should be on everyone's must-see list when in Miami. Consisting of only seventeen galleries, this is a small museum but its impact is big. It is part of a complex consisting of the Patricia Frost Museum of Science and a city park and is located in a coveted spot overlooking Biscayne Bay. The building is an attraction in itself, with hanging gardens and a grand staircase connecting the museum to the waterfront. Art can be found outdoors, too, on the terraces. A temporary installation of hundreds of hanging blue rubber tubes created a great place for children and their parents to play “hide and seek”. The focus of PAMM is on modern and contemporary art of the 20th and 21st centuries as it reflects the diversity of Miami and the United States in general. There is an emphasis on art of the Americas. Near the entrance, ticket booth and gift shop is an installation by London artist Hew Locke entitled “For Those in Peril on the Sea” (2011). It consists of dozens of colorful scaled-down replicas of boats and ships suspended from the ceiling and resonates particularly well with immigrants who came to Miami by ship. Upstairs is a large striking piece by Cuban artist Yoan Capote entitled “Island”. Created in 2010, it is done in black oils on jute with nails and fishhooks applied to represent waves in the ocean. The overall impression is one of movement. The Biltmore has had a checkered history as a luxury hotel. It survived well during the economic crisis of the 1920s and 1930s by hosting aquatic shows. 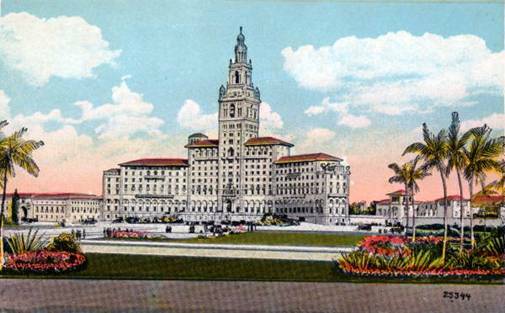 But then, during and after World War II, it served as a military hospital, and later became the first home of the University of Miami. Finally in the 1980s, the City put $55 million into renovating and restoring the hotel to its former glory and today it is on the National Register of Historic Places. Sit in the lobby, drink some lemon-infused water and admire spectacular hand painted frescoes on the barrel-vaulted ceilings, sparkling travertine floors and marble columns, leaded glass fixtures, and the old mahogany service desk and elevator banks. Italian, Moorish and Spanish architectural influences are evident throughout, and outside are the gardens. Overlooking all is the Moorish Giralda tower, splendidly lit at night and seen from miles away. 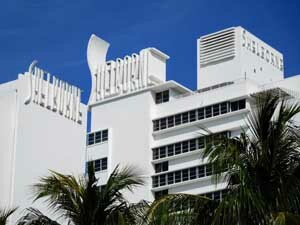 Shelborne Hotel, 1801 Collins Avenue, Miami, FL 33139; (305) 531-1271. This is a lovely hotel located near the luxury hotels in South Beach, but you can get bargain prices for some of the rooms using a AAA membership card. Art Deco Welcome Center/Miami Design Preservation League, 1001 Ocean Drive, Miami Beach, FL 33139; (305) 763-8026. Tours of the Art Deco District start here.